No sport provides a better opportunity to document the fan experience than baseball. Fantography: San Diego Baseball features amateur photographs taken by real fans—ballpark memories that often reach beyond the game-winning hit or strikeout pitch. 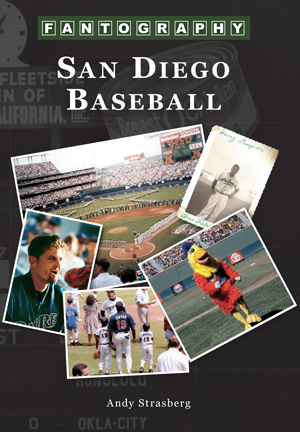 Within these pages is an assortment of images that peers into the Padres' Pacific Coast League days, the early years of struggling in the National League, the 1984 World Series season, and its recent years. Featured are household names like Tony Gwynn, Jerry Coleman, and Trevor Hoffman, as well as more forgotten players, managers, broadcasters, and ballparks. These are your snapshots, and they are from your personal albums. These images are accompanied by many Padres stories—your stories—that have never before seen print. Andy Strasberg coauthored Baseball's Greatest Hit: The Story of Take Me Out to the Ball Game and Baseball Fantography, and his first-person account of his fan-player relationship with Roger Maris is featured in Chicken Soup for the Baseball Fan's Soul. He was married at San Diego Stadium's home plate in 1976, is the San Diego SABR chapter vice president, has attended major-league baseball games in 52 ballparks, and still has the first major-league foul ball he ever caught—at Yankee Stadium in 1960 off the bat of Nellie Fox.